It’s playoff time with the attendant superb, intense hockey. With that intensity comes the traditional strategic playoff “match-ups”, which have been around for a long time: coaches taking advantage of home ice, to get certain lines out against one another. Coaches “game-plan” in an attempt to neutralize special talents like Ovechkin and Kovalchuk. Nowadays they seem to do so with more of an overall team defense approach. Much of this relates to modern-day “systems”, including the neutral zone trap which came prominently into play from about the mid-‘90s on. What we see in addition to a lot of “line matching” is certain defense pairings on the ice against particular forward-line combinations, or against particular players. Things were different—at least I remember things differently- in the ‘hey-day’ former Black Hawk great Bobby Hull. 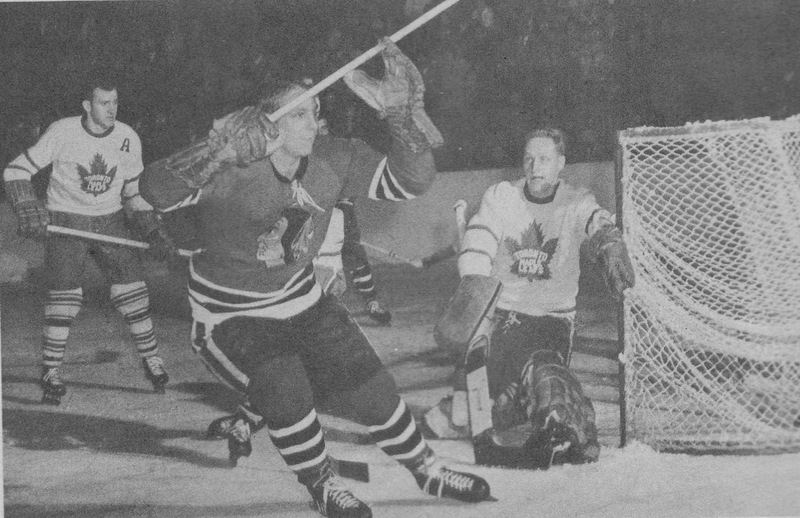 Hull (pictured above in late 1950s game action against the Leafs) jumped to the Hawks in the late 1950s as an 18 year-old straight from junior hockey. He was a strong skater and very explosive if he was allowed to wind up. He could shoot harder than anyone in the game for many years. He was only the third player in history to score 50 goals in a single season, accomplishing the feat in 1961-’62. He then broke through with a record-smashing 54 goals, surpassing “Rocket” Richard and “Boom Boom” Geoffrion in the 1965-’66 season. In the 1960s, most teams chose to cover Hull in a very particular manner—especially in the playoffs. They assigned one opposing winger to stay with him constantly. Virtually every team had one right-winger (Hull was a left-winger) whose job was to shut Hull down as best they could. (This was not a novel approach in those days. Richard had faced even more intense man-on-man coverage in his prime in the '50s.) They were Hull's "shawdow". 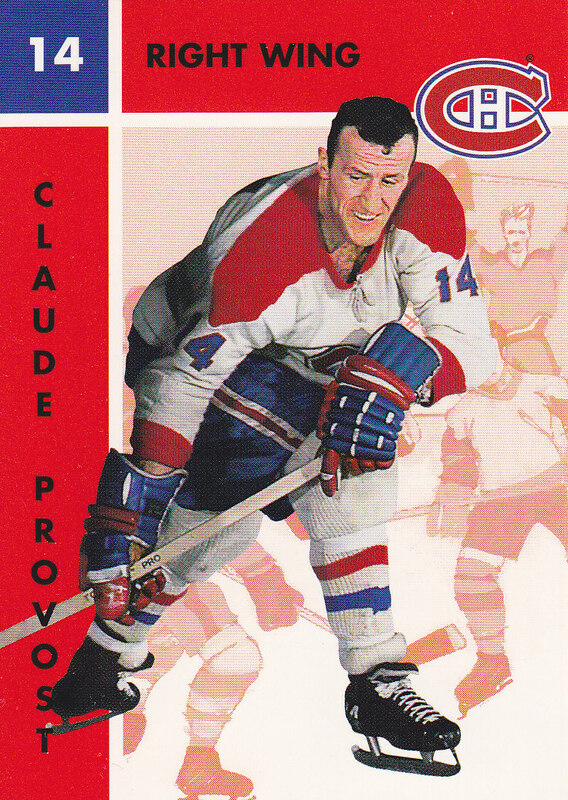 In Montreal, the job fell to Claude Provost, the versatile Montreal forward who had a lot of success against Hull over many years. Provost brought the added dimension that he was himself dangerous offensively. That was proven by the fact that he netted about 250 goals in 1,000 NHL games when goals were hard to come by. I recall that Hull was often complimentary of Provost, because while he tried to smother Hull as best he could, he didn’t just check Hull. He was a threat himself. In Toronto, Ronnie Ellis often had the job of shadowing the man they callled the Golden Jet, once Ellis joined the league in 1964-’65 as a 19 year-old with a reputation as a solid defensive winger. Like Provost, Ellis could score a bit himself, and his approach was not so much trying to skate smother Hull, but rather picking Bobby up as he was trying to gather steam with the puck. Ellis could skate very well himself so it was somewhat effective. The more annoying approaches came out of Boston and, especially, Detroit. Boston tended to utilize Eddie Westfall in the ‘60s to cover Hull. Now, Westfall became a fine all-around player over the years, a defensive specialist with the Bruins and later the Islanders, a guy who could chip in on occasion offensively. He became an outstanding penalty-killer, but in his early days he was a thorn in Hull’s side and focused almost exclusively on trying to contain Hull when Boston played Chicago. But the guy who seemed to bother Hull the most—and get him off his game—was Detroit’s Bryan “Bugsy” Watson. Hull hated the way Watson never left his side. Watson absolutely had no interest in trying to create offense. He was out there to try and stymie Hull, and I recall the semi-finals in 1965-66 when the Wings defeated the Hawks 4 games to 2. It was an upset, as the Hawks had home ice advantage in the series after finishing well ahead of the Wings in the regular season. Watson was a big part of that particular upset. Interestingly, those were the only two goals Watson scored in 32 career NHL playoff games. Watson had a lot of guts. He was a tough guy and that helped him play about 900 NHL games, mostly as a defenseman, with six different teams, including two different stints with both Montreal and Detroit. His career total was 19 goals, including those playoff markers. He was an agitator, pesky and he could fight. But for two seasons in the mid-‘60s while with the Wings, his claim to fame was that he was a huge impediment to Hull and the Black Hawks, playing as a pure checking forward. There may have been other guys who drew the unenviable task of shadowing Hull over his long and illustrious career. But the four players I’ve mentioned above were, in my recollection, the ones who stood out the most. And while they all gained some degree of acclaim for their efforts, in the long run, Hull’s talents over-shadowed the good work of the individuals and teams who aimed to contain him. He finished his splendid career with over 900 regular season goals (NHL and WHA combined) and well over a thousand, if we take playoffs into account. He won a Stanley Cup with the Hawks and championships in the WHA as well with the Winnipeg Jets. He changed hockey forever when he signed what was, for the time, a lucrative long-term contact to jump to the new league in the early 1970s. The WHA gained credibility because of Hull, and salaries jumped across the board in both leagues, ultimately forcing the NHL to merge with some of the WHA franchises in 1979. If there was something beyond Hall-of-Fame recognition, Hull would have achieved that, too. In his era he was in a special class with the old all-time greats like Harvey, Beliveau, the Rocket, Howe and Orr. As a Leaf fan, he was one of the few guys—like Howe and later Orr- who made me nervous every time they were on the ice. Teams don’t defend the same way nowadays in an effort to control the superstar forwards like Crosby and Ovechkin, but I’ll always remember, back in the ‘60s, how NHL teams tried to slow Hull down with a “shadow”—especially in the playoffs.